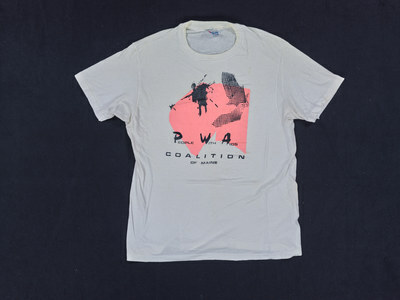 "PEOPLE WITH AIDS COALITION OF MAINE"
White t-shirt. Text: “PEOPLE WITH AIDS COALITION OF MAINE"
People With AIDS Coalition, ""PEOPLE WITH AIDS COALITION OF MAINE"" (2016). T-Shirts. 215.